"Stepping into Poetry - a Personal Journey"
When I was a child of three an older brother, in trying to teach me French, Spanish and Greek, introduced me to the pleasure in the sounds of other languages, without understanding meaning. From an early age accents and dialects fascinated me, whether the rough burr of farmers at an Ulverston auction market, or the lilt and fall of family-visiting Irish, Polish, Italian and American relatives in Cleator Moor and Whitehaven, mingling with west Cumbrian dialect and its why-use-two-syllables-when-three-can-make-a-word-into-a-song? For example, to-o-wast, for toast, or dad’s ‘Ista-ga’in tae Gaa-ity tae blaw tha’ nowuz an’ mak’ a scuttle?’ Meaning, ‘Are you going to the Gaiety Picture House in order to blow your nose and make a noise? "Column of air inside the chest"The delight in the rhythm of people’s voices is to me something that connects us through, as Robert Pinsky notes, a ‘column of air inside the chest’. As a child I only dimly understood that it was a seminal moment in my life. What did the experience mean? How could I ‘become part of the birches’? It was an experience that propelled me into wanting to gain an insight into this kind of imaginative encounter. It’s been an itch to be scratched, a mystery to be solved, a ‘something’ I need to address. It’s a lifelong quest and one way I felt it could be understood was through poetry. Mind you, I always thought you had to be clever to write poetry and go to Oxford or Cambridge University – poetry wasn’t for me! However, after years of working at a variety of office jobs and encouraged by my husband Geoff, I finally plucked up confidence, took the plunge and did a degree titled Imaginative Writing/Literature, Life and Thought thinking ‘well, if I’m useless at poetry, surely I can write an essay!’ To my delight I fell into poetry and came away at the age of 44 with a degree. "On the road" That was it. I was Paul on the Road to Damascus! Even more so when I went on a life-changing writing course at Ty Newydd, titled ‘Poetry, Healing and Meaning’ co-run by Rose Flint and David Hart, where I discovered that creative writing could be used in a therapeutic way. The light of realisation that yes THIS is what I want to do, use poetry/creative writing to help understand each other and our connections with the world, human and non-human, burns more fiercely than ever. Academic achievements: Geraldine Green gained a PhD in Creative Writing Poetry and an MA Creative Writing Poetry (Distinction) through Lancaster University; a BA Joint Hons (First) and a Research Diploma in Ecopoetics at Liverpool John Moores University. Her collections are The Skin and Passio Flarestack Publications, Poems of a Mole Catcher’s Daughter Palores Publications and The Other Side of the Bridge by Indigo Dreams. Geraldine was a contributor to a book on therapeutic writing titled Writing Works: A Resource Handbook for Therapeutic Writing Workshops and Activities published by Jessica Kingsley. 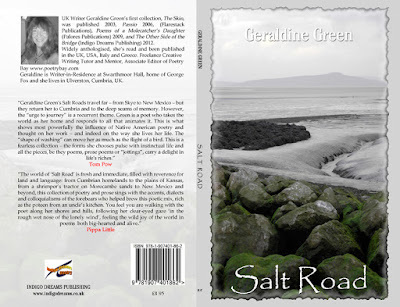 Geraldine’s poetry has been widely anthologised in the UK, USA and Italy and translated into Greek, German and Romanian. She frequently performs her poetry in the USA. In 2005 two of her poems ‘Green Lizards’ and ‘Early Morning Prayer’ were highly commended by Judge Penelope Shuttle in the Poetry on the Lake Competition, Orta Italy. *Stop Press* my third, full collection Passing Through will be published in 2018 by my publishers Indigo Dreams - thank you Ronnie and Dawn Goodyer! I thought I’d share with you a recap of the past 12 months, some of the workshops and courses, readings and gatherings I've been involved in and also anthologies I’ve had the pleasure to edit. About this time last year, together with two other editors and poet friends, Nick Pemberton and Ann Wilson, we each felt the need to reach out to Cumbrians affected by last winter’s storms. Many of the people affected are still out of their homes, have lost businesses or are struggling in some way to re-build their lives, to tell their stories. So each of the three of us invited other Cumbrian-based writers to send us a poem or prose piece written in response to Storm Desmond. The result is the anthology WATERSHED published by Harestone Press. 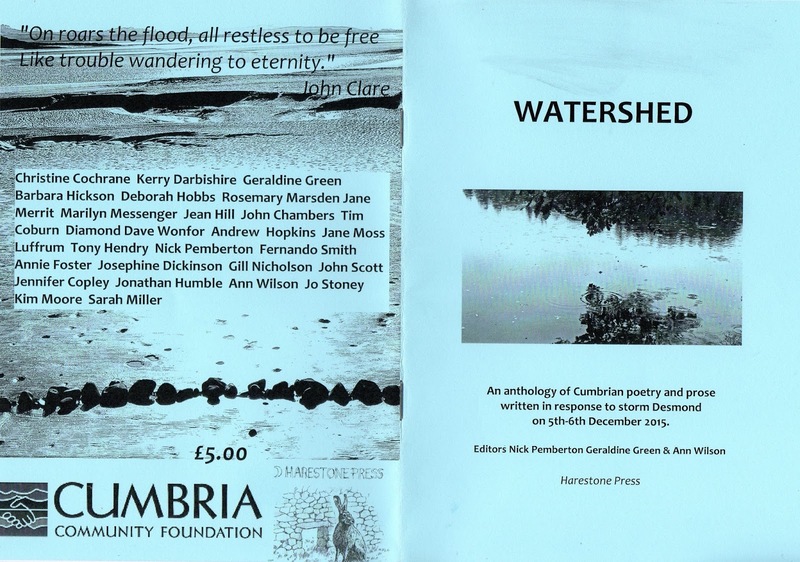 So far, through readings workshops, word of mouth, social media, we’ve raised over £1,000, which has been donated to the Cumbrian Community Foundation Flood Recovery Fund. It was a year of a wide variety of projects for me. First off was putting into place what was discussed at a meeting in December 2015 with Brantwood’s Rachel Litten and Howard Hull. 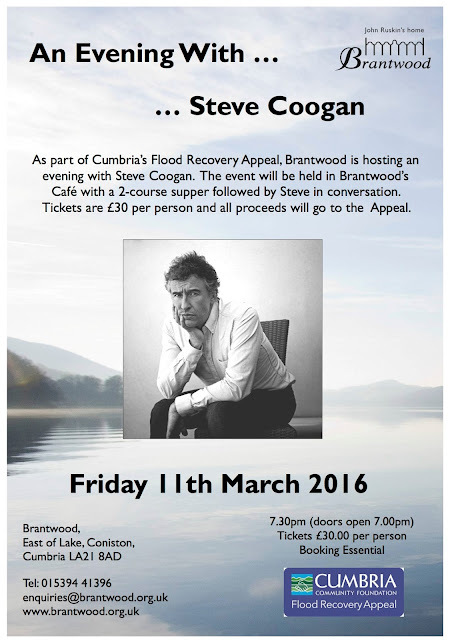 As writer-in-residence at Brantwood I was invited to put forward ideas for events to be held there. I’d heard an interview on BBC Radio Cumbria between Caroline Robertson and Steve Coogan. Steve Coogan had been trapped in the floods and a landslide at Thirlmere during Storm Desmond. During the interview he explained how he’d been trying to get to his cottage at Coniston to check it was ok. He tried all ways to get there but eventually ended up spending the night – eight hours! – trapped in his car round the west side of Thirlmere, in the dark, with his Cockerpoo dog and only fruit and nuts to eat. He said he felt like Bear Grylls only his food was from M and S! Leave it with us, said Rachel and Howard. He was very supportive and open-hearted sympathetically aware of how the floods had affected people in Cumbria and elsewhere. He said at he end of his talk, “If there’s anything I can do to help, contact politicians, help make your voices heard, then let me know.” The event took place on March 11th 2016. All in all a great evening with a very funny guy and a down to earth one, too. At the December 15th meeting we also discussed the idea of combining an evening of poetry and music. Rachel suggested Jess Gillam, who, like me, is from Ulverston. I said yes, sure! Great idea. She’s fab! Jess is a young saxophonist and impresario. She was runner up at the BBC Young Musician of the Year 2016 and is an all round energetic, enthusiastic person who shines on stage. As well as continuing to tutor creative writing courses at Brantwood, which I’ve done for the last six years, I suggested a poetry evening with open mic to round the year off, so to speak! I invited Cumbrian-based poets Kerry Darbishire and Kim Moore to read alongside me. The evening also included supper at Brantwood’s café. The open mic produced some fine readers. It took place on November 3rd 2016 and was a great success! So much so that we’re repeating it in 2017! Come and join us on November 2nd 2017 at Brantwood café Coniston. I have the pleasure of reading alongside Graham Mort, Kerry Darbishire and Kim Moore. There’ll be an open mic again, too! 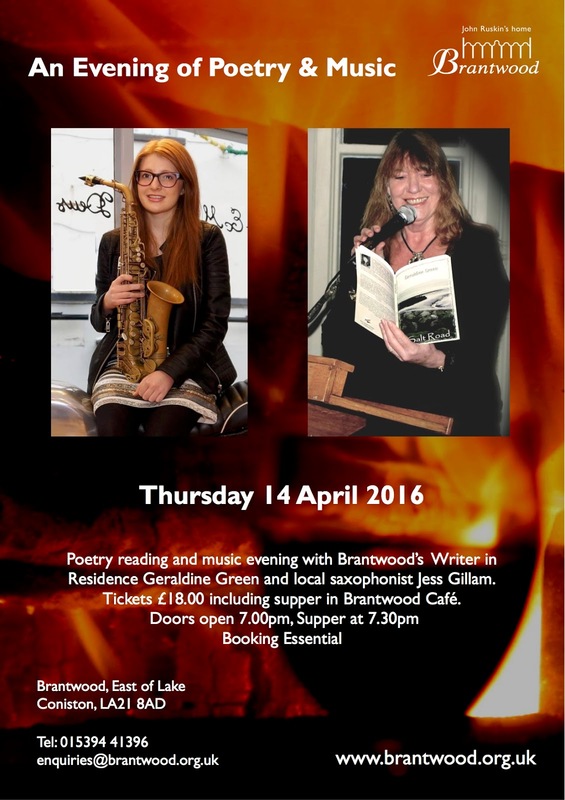 Contact Brantwood and get your name down for a slot – open mic places limited! 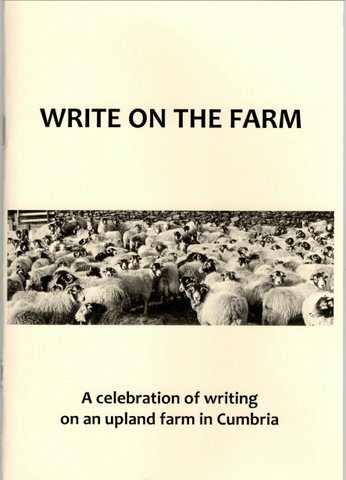 Each month, for the past six or seven years or so, I’ve been holding writing workshops, at first in my own home and a variety of local venues, such as Swarthmoor Hall and Bardsea Village Hall, until a friend and member of the writing group kindly suggested we hold the writing workshops on her farm. What a place for poetry and nature writing! Thank you Jane. An upland farm near Kirkby Lonsdale, warm farmhouse kitchen, large living room where we hold the writing workshops, cosily snuggled down on winter days by a wood-burning stove, or enjoying the sight of swallows darting to and fro outside the windows as we write, discuss, laugh and engage with our writing. It’s a lovely gathering of like-minded writers, sustained by home made bread, chutneys, cakes, jams and anything else that the group may have baked. It’s a friendly, supportive, professional and dedicated group of writers and I’m proud to have edited an anthology of their fine writing, called WRITE ON THE FARM published by Harestone Press, image by Stephen Darbishire. Poetry and the Harp: The first write on the farm workshop in 2017 is on February 25th. I’ll be co-tutoring the morning session with harpist and writer Christine Cochrane. All welcome! Update: Poems from the Harp workshop will be published in Poetry Scotland, Autumn 2017, ed. Sally Evans - thanks Sally! A couple of years ago I’d read something about Eycott Hill… about how Cumbria Wildlife Trust were planning to submit a bid to buy it and create a new nature reserve there. Now, I know Eycott Hill! We almost bought a house in Berrier – another story – and knew I’d read an article in the Keswick Reminder about the Singing Stones of Eycott Hill… a stone xylophone that’s in the Keswick Museum made of certain kinds of stones that make a sonorous ringing sound when struck. With this in mind I contacted Cumbria Wildlife Trust – then thought nothing of it until a little while later I was emailed and asked: “Was I still interested in running creative writing workshops on Eycott Hill?” Was I!! Oh yes, delighted! The upshot was a couple of workshops held on Eycott Hill, a wild fell composed of Eycott Volcanic rock close to Blencathra, remote, lonely and uplifting, a place to stop, reflect, listen and to write. Two workshops were held, one in May 2016 and one in July 2016. Another is planned for 2018. The restoration of the Hay meadows, the purchase of the hill could not have been possible without funding through the Heritage Lottery Fund. Thank you, too, to Jody Ferguson of Cumbria Wildlife Trust. One of my monthly ‘write on the farm’ writing group asked us if we’d be interested in taking part in a project with the National Trust’s Gondola on Coniston Water… naturally we all said yes please! I arranged for our group to meet at Brantwood, spend the morning on the Steam Yacht Gondola and the afternoon on a writing workshop at Brantwood. We wrote in response to our sail on the wonderful Gondola – if you’ve never been on it, do take a ride! Big thanks to the National Trust, especially to Jo Haughton and all the crew of Steam Yacht Gondola. read poems here this issue contains a special feature of UK poets. Delighted to run a workshop for Bank Street Writers Bolton, September 16th 2017! And to be invited back to run another one for them in 2018! I'm also delighted to be teaching another adult education class at Dallam Community Centre, Heversham. It's the fifth year I've taught them. Last term the workshops were titled "Exploring Poetic Forms"and an anthology celebrating participants' work was produced by Dallam. So! All in all a positive year with plenty of exciting new projects rubbing shoulders with long running workshops and courses – and more planned for 2017! Indigo Dreams writer Geraldine Green has a busy autumn schedule! As well as teaching a 10 x week creative writing course for Dallam Adult Ed. Heversham, Geraldine is also leading a poetry workshop for Bank Street Writers Bolton on September 6th. With thanks to Rod Riesco for inviting me along and for inviting me to run another workshop for them in 2018! Lovely group, talented and welcoming. November sees Geraldine, former Brantwood poet-in-residence, hosting and reading at Brantwood on Thursday 2nd alongside invited guests IDP poet Kerry Darbishire, plus Graham Mort and Kim Moore. There’s an Open Mic and supper. Geraldine is also taking part in Dalton LitFest the new Literary Festival Dalton-in-Furness, Cumbria where she’ll be reading from hew new collection Passing Through with Seren poet Kim Moore at the launch on Friday 3rd November and co-hosting an Open Mic with Kim on Saturday 4th. Says Geraldine “I’m very excited to be part of this new festival when I’ll be reading from my new collection Passing Through, to be published by Indigo Dreams in 2018 – thanks Ronnie and Dawn, it’s such a treat to be working with you both again!” IDP poet Kerry Darbishire will also be taking part in the festival. Brantwood, Coniston, Cumbria, former home of John Ruskin is the perfect place whether you have a writing project you’re working on or just need time and space away from the busyness of life to step back and gain some inspiration and quietly reflect. The tranquil grounds and gardens of Brantwood, stunning views across Coniston Water to the Old Man and Dow Crag, log fires, wonderful food all provide the ideal writers retreat. There will be time for solitude and also the company and conversation of other writers. Co-tutor Graham Mort will give a reading with Geraldine on Tuesday evening. You’re all welcome to share a poem or two, as well on Wednesday evening when the Group give a reading to the tutors. Mentoring - The Retreat also gives you an opportunity for one-to-one mentoring plus informal discussions with the tutors. This includes evening meals on Monday, Tuesday and Wednesday and lunch on Tuesday, Wednesday and Thursday. The Lodge at Brantwood has been newly refurbished to provide accommodation for those attending our courses. It sleeps up to 9 people in 2 double rooms, 2 twin rooms and a single room, located on the ground and upper floors, with a shared kitchen/diner and living room, 1 bathroom, 2 shower rooms and a separate toilet. The Lodge enjoys wonderful views across Coniston Water to the fells. A self-service breakfast is provided in the Lodge as part of the rate. BandB accommodation is available for those participating in Brantwood's courses. Staying at Brantwood is one of the delights of studying here, spending time in good company and immersing yourself in the whole experience. Brantwood Lodge has been newly refurbished and will sleep up to 9 people, with 2 twin rooms, 2 double rooms and a single room. The Lodge enjoys wonderful views across Coniston Water. There is a communal kitchen/diner/living room with a wood burning stove. The BandB rate is £50 per person per room/£35 per person shared occupancy/£35 per night single room. Breakfast is provided in the kitchen for guests to help themselves to cereal, toast, fruit, yogurt. Accommodation can also be booked for partners in double/twin rooms at the same BandB rate. The Coachman's Quarters, situated above the cafe, is also available if required. 1pm - Gather at The Lodge for refreshments, Geraldine, Graham and Rachel will be there to meet you and show you your rooms. 1.45pm - Meet in The Schoolroom in the Main House where writing workshops will take place. This is accessed by steps close the front door of the main house, through the Studio and into the Schoolroom. Please ask at Reception, staff will be available to give you directions. 2pm - The Schoolroom: Welcome and Introduction with Graham and Geraldine. Ask names and also which genres they write in. 4pm-5pm – in the Schoolroom: quiet writing time, followed by readback/feedback on ONE piece of writing produced during this session. 1.30pm-5pm - Free writing and reflective time. Participants are welcome to explore the house and gardens (Free to participants). One to one tutorials will be available between 2pm and 4pm. 2pm-4pm – Parallel one to one tutorials with Geraldine and Graham in The Schoolroom, 15 minutes slots. Please put your name down on the sheet provided. This will be left for you in the Schoolroom kitchen. Further one to ones available during Thursday morning session. Additionally, there will be time for close readings of writing produced during the course, or you may wish to share writing from a current project. 11.45am-12.45pm - Group readback and feedback, complete Feedback Forms. 1pm-2pm Lunch in Brantwood Café and depart. Note; Course participants are welcome to explore the House and Grounds during their free time. Brantwood Main House closes at 5pm. The grounds are open 24 hours.